The new round of bidding for oil and gas blocks, unlike before, will allow those exploring to carry on irrespective of the nature of the fuel they find. Petroleum Minister M. Veerappa Moily has set the ball rolling for the next round of the new exploration licencing policy (NELP). It is the tenth round of the NELP, probably the last, as it may soon be replaced by Open Acreage Licensing Policy, which will permit companies to select the blocks they want to explore without waiting for the government to make an offer. The change this time is that NELP X offers an integrated approach to exploration. The block operator will be allowed to go ahead irrespective of the fuel found - coal bed methane, shale gas, conventional gas or oil. "There will be the same contract with no distinction relating to the source of gas," says P. Elango, CEO of Cairn India. "This is a step forward." Currently, companies can only explore the fuel specifically mentioned in their contracts. Recently, the petroleum ministry declared the shale gas policy. which allows only PSUs to participate in exploration. But under NELP X, even private companies can tap shale reserves if discovered in the blocks allotted to them for exploring other fuels. 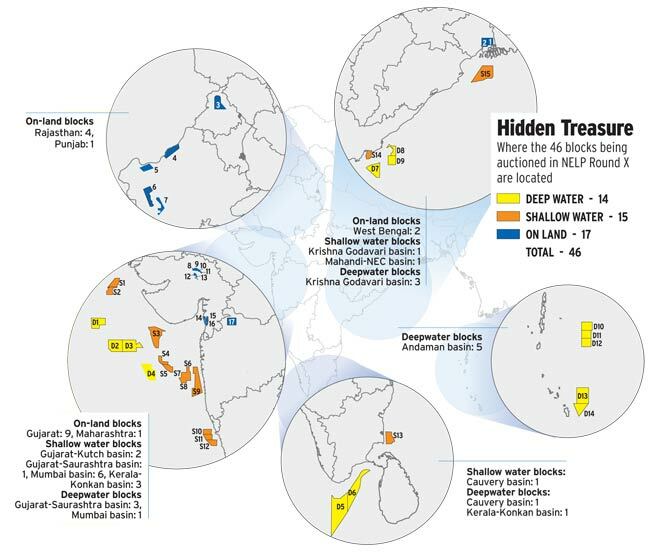 In 2009/10, US-based Joshi Technologies had informed the Directorate General of Hydrocarbons (DGH) that it had hit upon shale rocks while exploring its block in the Cambay basin off Gujarat. But it was not given clearance to go further, since no policy had been formulated. Much has changed. In a significant policy decision, the petroleum ministry notified the new gas pricing formula for domestic gas, which in fact has paved the way for the current auction of blocks. The new formula links the gas price with the price of gas at four international hubs. "Now things are much more streamlined," says an official in petroleum ministry. The pricing formula for gas having been determined, the ministry is pushing for a revenue sharing model, he adds. All necessary approvals are in place for the auction of the 46 blocks, according to Moily. Of these 17 are onland, 15 are shallow water and 14 are deepwater blocks. This round will include the auction of blocks in two of India's basins with proven potential - one in Rajasthan and the other near the Reliance Industries' (RIL) owned KG D6. But in his hurry to announce the new round of NELP, the petroleum minister seems to have ignored the fact that the cabinet is yet to decide on the fiscal regime for the round. Officials in the DGH also say the list announced by Moily is not final yet and 10 to 15 more blocks might be auctioned, along with the 46 shortlised. The minister has not yet announced the auction date. Moily himself is keen on revenue-sharing contracts with explorers, replacing the current profit-sharing mechanism or the cost recovery model. This was also suggested by a committee headed by the Prime Minister's Economic Advisory Council Chairman, C. Rangarajan. A revenue-sharing contract would not be linked to the cost incurred by the operator. This is important in the wake of the controversy involving RIL - the company has been accused by some of 'gold-plating' (inflating) its KG-D6 gas field costs to take a larger share of revenues than it should have. But a revenue generation contract, which does not factor in the cost incurred by the operator, is unlikely to go down well with the private sector. "This might not be an attractive regime for the biggies of the world," says Aashish Mehra, Managing Partner of the US based Strategic Decisions Group's Asia Pacific chapter. 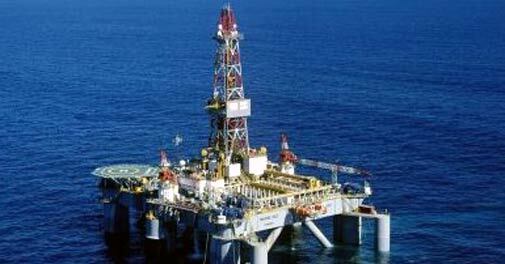 India, in any case, is not an attractive destination for investments by oil and gas exploration companies. In the last nine rounds of NELP auctions over 16 years, India offered 254 blocks, which-after 128 discoveries from 42 blocks-are producing a meagre 6,938 barrel of oil per day, and 14.14 mmscmd of gas. In contrast, a pre-NELP block in Rajasthan operated by Cairn India produces 200,000 barrels daily. This is the reason many cabinet ministers want to continue with the existing cost recovery model. "The cabinet has to take a view on the financial regime. Some Cabinet colleagues have their own views, we will weigh them and then take a decision," says Moily. In a recent report, a high-level committee headed by Vijay Kelkar also ratified the cost recovery model. Moily, then, appears to be pushing ahead with NELP X without tying up all the loose ends. Also, experts believe that to invite international players, India needs to do extensive marketing including road shows, at which the minister's presence is required. "When general elections are round the corner, it looks really impractical to have bids before it," says an industry expert, on condition of anonymity.